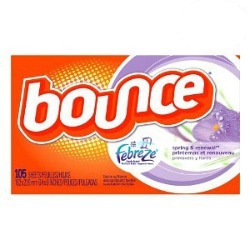 Karen has shared her Bounce fabric softener sheets review, in the Outdoor Fresh scent. 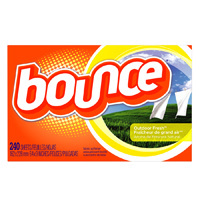 I have used Bounce Outdoor Fresh dryer sheets for many years. I think that they have the best scent and last the longest for the lowest price. When I was first living on my own and trying to save money I tried using a generic dryer sheet. I would have to use several sheets at a time to get the scent to be on my clothes even when I took them out of the dryer. I finally realized it was better to spend a few extra cents and use the Bounce sheets I had used growing up. It only takes one sheet and the amazing scent will stay on your clothes for a long time. I never have a problem with static when I use Bounce and it doesn't leave any greasy feeling to your clothes like I've encountered with other dryer sheets. I have incredibly sensitive skin and so do my children. Bounce is one of the few fabric sheets that we have used that does not cause skin irritation on any of us. It is a great product. I have even started using the dryer sheets when I store my clothes for the season. I place a single sheet into each storage bag and my clothes come out the next season smelling fresh as if they had just been washed. Thanks Karen for your Bounce fabric softener sheets review. Has anyone else used Bounce sheets in the dryer with their clothes? If so, you can share your Bounce dryer sheets review here. In addition, you can share your review of other dryer sheets brands here, telling me what you think about them. Crystal shared her experience with the Bounce fabric softener sheets containing Febreze. These leave spots on dark clothes. My machines are only two months old and this started happening when I switched from Snuggle. I switched back and no more problems. So annoyed! Thanks so much for sharing your experience Crystal, too bad it wasn't a good one though. Has anyone else had this problem with these Bounce dryer sheets? If so, please share your experience here, including any way you removed the spots or stopped them from forming, if you ever figured this out. In addition, you can get some tips for removing those dark stains, assuming they are caused by the softener, on my fabric softener stain removal guide page. We had placed a number of your fabric softener sheets on our carpet to reduce the smell of urine from our dog. Our daughter came over with her 19mo old toddler and insisted we pick them up so our granddaughter wouldn't touch them. Would there be any harm to our grandkids if they touched/handled them?